It's a fact - understanding Basic Beats improves Sight Reading. 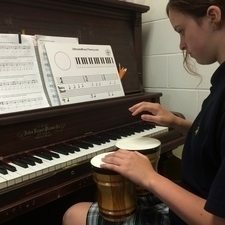 When your student understands the Basic Beat, they will be able to successfully complete the new Rhythm Component in Sight Reading on their Royal Conservatory of Music Exam! That's right - understanding theory makes Sight Reading (and Ear Training) easier! Tap a steady beat with their foot or hand for one measure, then continue tapping while speaking, tapping or clapping the given rhythm. In summary, the student must tap the Basic Beat with one "body part" and the Rhythm with another "body part"...at the same time. This skill is required beginning with the Royal Conservatory of Music Preparatory A Piano Exam. So, how do we teach it? Easy - use the Ultimate Music Theory Prep 1 Rudiments Workbook and teach your student about Basic Beats and Scoops! 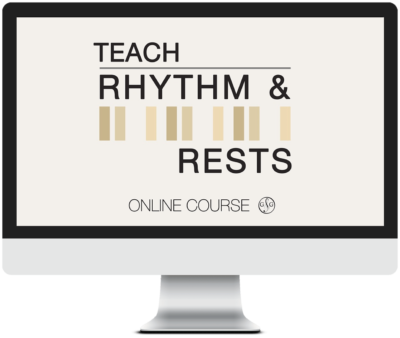 The Basic Beats improve Sight Reading by teaching students to see how a rhythm is counted. By seeing that notes are "scooped" into Basic Beats, the student learns how to maintain that steady pulse. When a student can easily visualize the Basic Beat Scoops, they can tap that Basic Beat with one body part while tapping the rhythm with another. So, start scooping your Basic Beats! Scoops are introduced in the Prep 1 Rudiments Workbook on Page 48. This Lesson is on Time Signatures. Students learn that the Bottom Number of the Time Signature is the Basic Beat. One scoop is equal to one Basic Beat. When the Bottom Number of the Time Signature is a Quarter Note, then the Basic Beat is one Quarter Note. One scoop will equal one Quarter Note. Scoops are joined together when note or rest values equal more than one Basic Beat. Even though students at this level are only learning Simple Time with a Quarter Note as the Basic Beat, an understanding of this concept will make learning any Time Signature easy. Whether that Bottom Number of the Time Signature is a 2 (a Half Note), 4 (a Quarter Note), 8 (an Eighth Note) or 16 (a Sixteenth Note) - it is one Scoop! Scoops are a visual representation of the sound or rest "space". Scoops define the steady beat - the pulse of the music. This is the "Tap a steady beat" requirement in the RCM Sight Reading. Understanding the Basic Beat improves Sight Reading! You can "pre-teach" the RCM Sight Reading Requirement with your students beginning in the Prep 1 Rudiments Workbook. ( This is usually well before they start the RCM as I am a firm believer in the value of teaching Theory from Day #1 on our Musical Journey). As soon as they start on Page 48 in their Prep 1 Rudiments Workbook, you can start tapping a steady Basic Beat with one body part and tapping the rhythm with another. 1. Use the Bongo Drums or Boom Whackers (or any 2 percussive instruments). Tap the steady Basic Beat with the left hand while counting aloud (YES - count aloud! You can count aloud on an RCM Exam!). Then tap the rhythm with the right hand. 2. Use a foot stool (to make a louder sound than tapping the foot on carpet!). Tap the steady Basic Beat with the left foot on the stool (either tap the toe or the heel) while counting aloud. Then clap the rhythm by clapping the hands together for each note (and opening the hands "apart" for any rests). 3. Stand up and March! "March" to the steady Basic Beat while counting aloud. Then clap the rhythm. All of the above can be done on an examination too! You may have discovered your own way to have your students perform the Sight Reading Rhythm portion of their exam. Feel free to share it below. When a Student is given their RCM Sight Reading Requirement on their Exam, they are given an "appropriate amount of time" to review the rhythm before they tap, rap or clap it. They are not expected to begin immediately! 5 Easy Steps to easily prepare your students to complete the "Rhythm Reading"
Step 1: Identify the Time Signature. Step 2: Identify the Basic Beat (the Bottom Number of the Time Signature). Step 3: Identify the number of Basic Beats in each measure (the Top Number of the Time Signature). Step 4: Physically point to the music and use their index finger of the right hand to scoop each Basic Beat on the music while they "silently" count aloud (I call this Ghosting" - it allows them to pre-read the rhythm before they have to "perform" it.). Step 5: Then - "tap a steady beat with their foot or hand for one measure, then continue tapping while speaking, tapping or clapping the given rhythm". See? Understanding the Basic Beats makes Sight Reading EASY!